Recruitment 2018 Notification. An objective type written test and computer knowledge practical test will be conducted for this Odisha PSC Assistant Section Officer jobs recruitment 2018. Written exam will be conducted for 400 marks, which consist of 3 different papers. Computer Knowledge Practical Test will be conducted for 50 marks. OPSC Assistant Section Officer Written Exam Date is November-2018. Degree qualified and computer knowledge having candidates are eligible to submit application form online for this Assistant Section Officer vacancies. OPSC Assistant Section Officer written Exam Syllabus, ASO Exam Pattern, ASO Computer Practical Exam Syllabus, Previous Question Papers is updated below. 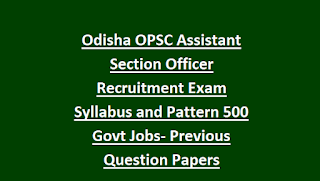 There are total 500 Posts in this OPSC Odisha State Secretariat Service Assistant Section Officer jobs recruitment. As on 01-Jan-2018 age limits 21-32 years for Assistant Section Officer Posts. For Assistant Section Officer posts candidates must have quailed Degree and should have computer knowledge. Pay Scale : Rs.9300-34800 /-. Application fee is Rs.300/- for unreserved and SEBC candidates. For other no application fee. Candidates selection for this OPSC Recruitment 2018 will be based on written exam and skill test of computer knowledge. Written Exam will be conducted for 400 Marks for and consists of 3 papers for this OPSC Assistant Section Officer ASO Posts. Paper 2 Exam Patten-Consists two parts. 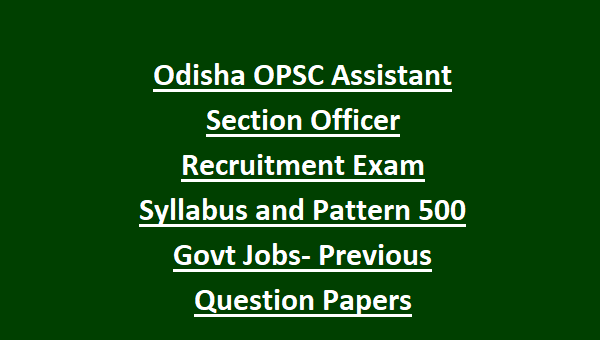 Apply online through Oidsha OPSC website of www.opsconline.gov.in for these Assistant Section Officer posts before the closing date of 09-11-2018. OPSC ASO Exam Admit card release date, OPSC Assistant Section Officer Posts Exam Syllabus and Pattern, ASO Exam Date and other details are updated in this website only.